SpoiledOnes....For a limited time, qualified customers that bring their number from Cricket or MetroPCS to Boost Mobile can get unlimited data, talk and text with up to 2.5GB of high-speed 4G LTE data starting at $20 a month!! Boost Mobile is giving you the chance to cut your payment in half for a limited time. 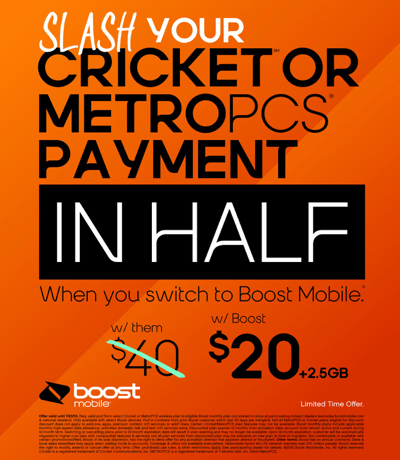 So you must act fast.... Now through July 20, customers bringing their phone number over from Cricket or MetroPCS can save between $20-30 per month for a full year. The value associated with the Slash Your Payment in Half promotion from Boost Mobile is undeniable. A MetroPCS customer that is currently receiving 2GB of data for $40 a month, can now get 2.5GB of high-speed data from Boost Mobile for just $20, while a Cricket customer receiving 10GB of data for $60, can now get the same amount of data for only $30 a month. SpoiledOnes, you know we love our phones and we also love a deal...spoil your wallet and save some cash with this great offer! get unlimited talk, text and data with 2GB of high-speed data for $30 per month. Sounds like a great deal so don't procrastinate, offer ends July 20th! !